[S12] C. Arnold McNaughton, The Book of Kings, volume 1, page 457. He was given the name of Alexander Eugen Philipp Albrecht Ferdinand Maria Joseph Ivan Rilsky Johannes-Joseph at birth. 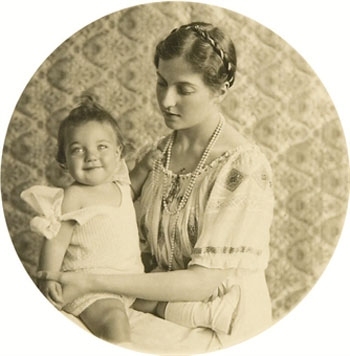 Margareta Luise Herzogin von Württemberg was born on 25 November 1928 at Karlsruhe, Baden-Württemburg, Germany.1 She was the daughter of Albrecht Eugen Herzog von Württemberg and Nadejda Klementine Maria Pia Majella of Bulgaria, Princess of Bulgaria.1 They were also married in a religious ceremony on 8 August 1970.1 She married François George Marie Luce-Bailly, Vicomte de Chevigny on 7 August 1970 at Altshausen, Wurttemberg, GermanyG, in a civil marriage. She died on 10 June 2017 at age 88. She was given the name of Margarita Luise Eudoxie Nadejda Maria Josepha Albertine Therese Amelie Elisabeth Benedicta Rosa Catharina Elisabeth-Bona at birth. From 7 August 1970, her married name became Luce-Bailly. Sophie Herzogin von Württemberg was born on 16 February 1937 at Stuttgart, Baden-Württemburg, Germany. She is the daughter of Albrecht Eugen Herzog von Württemberg and Nadejda Klementine Maria Pia Majella of Bulgaria, Princess of Bulgaria.1 She and Antonio Manuel Roxo de Ramos-Bandiera were divorced on 11 February 1974. She married Antonio Manuel Roxo de Ramos-Bandiera on 17 February 1969 at Altshausen, Wurttemberg, GermanyG. She was also known as Sophie Eudoxie Louise Josepha Margarethe Theresia. Her married name became de Ramos-Bandiera. Her marriage to Antonio Manuel Roxo de Ramos-Bandiera was annulled on 18 October 1976 at Freiburg-im-Breisgau, GermanyG. Antonio Manuel Roxo de Ramos-Bandiera was born on 2 August 1937 at Santa Isabel, PortugalG. He married Sophie Herzogin von Württemberg, daughter of Albrecht Eugen Herzog von Württemberg and Nadejda Klementine Maria Pia Majella of Bulgaria, Princess of Bulgaria, on 17 February 1969 at Altshausen, Wurttemberg, GermanyG. He and Sophie Herzogin von Württemberg were divorced on 11 February 1974. He died on 23 February 1987 at age 49 at Rio de Janeiro, BrazilG. His marriage to Sophie Herzogin von Württemberg was annulled on 18 October 1976 at Freiburg-im-Breisgau, GermanyG. Karl Salvator Erzherzog von Österreich was born on 30 April 1839 at Florence, ItalyG.2 He was the son of Leopoldo II Erzherzog von Österreich Granduca di Toscana and Maria Antoina di Borbone, Principessa di Borbone delle Due Sicilie.3 He married Marie Immaculee di Borbone, Principessa di Borbone delle Due Sicilie, daughter of Ferdinando II di Borbone, Re delle Due Sicilie and Maria Theresia Isabella Erzherzogin von Österreich, on 19 September 1861 at Rome, ItalyG.4 He died on 18 January 1912 at age 72 at Vienna, AustriaG.4 He was also reported to have died on 18 January 1892 at Vienna, AustriaG. He gained the title of Principe Karl Salvator di Toscana. [S12] C. Arnold McNaughton, The Book of Kings: A Royal Genealogy, in 3 volumes (London, U.K.: Garnstone Press, 1973), volume 1, page 247. Hereinafter cited as The Book of Kings. [S12] C. Arnold McNaughton, The Book of Kings, volume 1, page 368. [S12] C. Arnold McNaughton, The Book of Kings, volume 1, page 369. [S12] C. Arnold McNaughton, The Book of Kings, volume 1, page 279. Alexandra von Grünhof was born on 10 August 1861 at Wiesbaden, Hessen, GermanyG. She was the daughter of Ernst Herzog von Württemberg and Natalie Eischborn.1 She married Robert von Keudell on 15 September 1883. She died on 13 April 1933 at age 71. Her married name became von Keudell.